When we were camping in the jungle, a campfire was one of the most important things we required to survive. 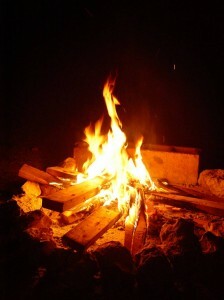 A campfire can ward off wild animals, produce warmth, signal danger and cook food. The choice of location for a campfire. Tools and materials that are available around the vicinity of the camp area. The direction of the wind (important to know in order to make the fire safe and lasting). Find an area that is sheltered from strong wind. Build your fire on dry ground. 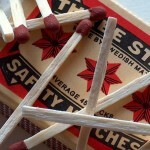 Fire Ignition – Use dry material that will easily catch on fire by application of heat or sparks. For example: use shaved wood, dried moss, dead fern, dry leaves, sawdust, gauze, straw, etc. Angler Fire – Add this material once a spark occurs. This material will further increase the size of the fire. 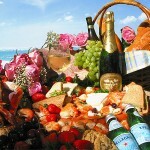 For example: use twigs, small pieces of wood, bark, etc. Fuel – Once you have a good starter fire, gradually add the fire’s fuel. For example: use large twigs, dry logs, etc. If you don’t even know the basics to making a campfire, the experience can be a troublesome one. Create a controlled area for your campfire that will limit its size. Pile stones around the base of the fire, or dig a shallow pit where the fire will be. Collect wood, twigs, leaves – material that is dry and flammable. Stack dry wood with large diameters at the bottom, followed by smaller sized wood at the top in a cross, allowing for air to breathe through the gaps. Cover your wood with quick burning dry leaves, twigs, or moss. Set your dry mixture alight. When the fire has begun to dilate, feed the flames with small twigs and sticks. Gradually build your fire. Do not rush to add more twigs to the top. If the fire has prematurely died and only the embers remain, blow on one spot of the fire until the fire begins to grow again by itself; add some dry leaves to help it along. A campfire may seem easy, but there are some things to consider in order for a campfire to last and keep controlled. Make sure the timber you use is completely dry. Do not burn all the wood at once, it must be gradual. Note the air circulation! Fire needs oxygen to grow. In case of rain, cover the embers with a bush or the like, so that when the rain lets up, you can remove your covering and re-build your fire. Make sure you completely put out your fire when you no longer need it. If you want to camp for a long time and don’t want your fire to die, stack extra large wood at the fire’s base. If you’re going to sleep for the night, add some more logs and coal; this way you’ll have some remnants for a campfire the next morning. At that time, simply add twigs and dry leaves and blow on it until a flame takes. You should only put extra logs on your fire before you sleep if your fire is set in a safe location away from your campsite, trees, shrubs etc. 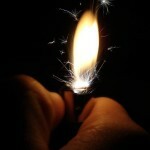 Sparks can come off from your fire and catch fire elsewhere. Please use extreme caution with your fire as injury or forest fires can occur. If you’re looking to Cook on the Campfire here are some great tips and some tasty Camping Recipes. If you know of any campfire cooking tips or camping recipes we would love to hear them! Please share them in the comment box below. No responses to "Guide to Making a Campfire"